SB - Glee S. Smith, Jr. The late Glee Smith Jr. was raised in Rozel, Kansas. After returning from World War II and the Army Air Force, in 1947 he joined Maurice A. Wildgen (1911-1979) to form the Larned firm Wildgen & Smith. As Pawnee county attorney from 1949 through 1953, Glee began a long and distinguished state political career in 1957 when he was elected to the Kansas Senate. He was President pro tem, the top spot in the Senate, from 1965 through 1973. 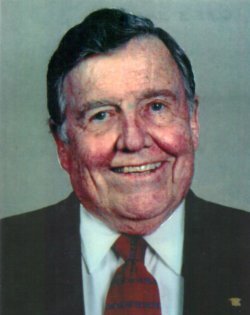 He served on the Kansas Judicial council in 1961-63, and was an active member of the National Conference of Commissioners on Uniform State Laws from 1963 until recently. In 1975, Governor Robert Bennett appointed Glee to the Kansas Board of Regents, where he served as chairman in 1977 to 1979. President Gerald Ford appointed Smith to the National Legal Services Corporation for the four year term beginning in 1975. Mr. Smith died on November 16, 2015, at age 94.